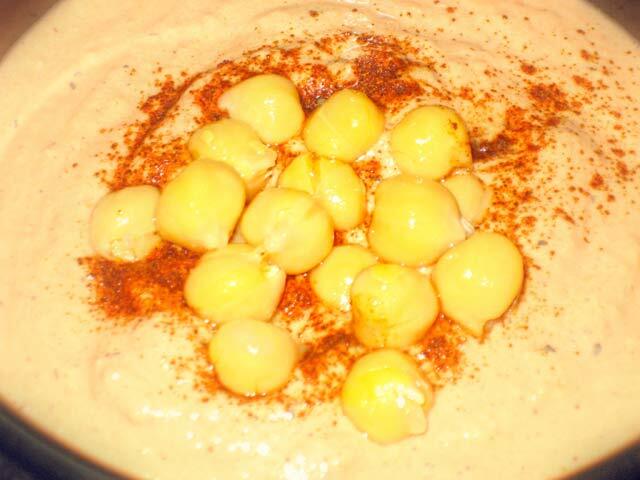 Hummus is a very popular Middle Eastern spread made from chickpeas and tahini. It is used as a dip for pita bread or vegetables. It can be a side order or sauce to a main course. I personally use it as a spread my everyday sandwiches, instead of using mayonnaise. It is much healthier since hummus is a good source of Iron, Vitamin C, Folic Acid. It is also high in Fiber. Even though you can buy hummus in any store nowadays, the hummus they sell is not as nutritious. I prefer to make my own. There are two way to make hummus. You can use dried chickpeas and take about a day to make the recipe, or you can use canned chickpeas and take several minutes. The longer method takes better, but for most cooks don’t have the time. I also do a variant of hummus that includes garlic and fire roasted tomatoes. I love the smoke flavor that is achieved by the fire roasted tomatoes and the bite from the garlic. 2 Fresh Tomatoes or a 15 Oz Fire Roasted Canned Tomatoes. If you are using canned chickpeas you may skip ahead. First you have to clean the dried chickpeas from dirt and rocks they might have. Wash the chickpeas several times until the water is clean. Let soak in water overnight. Be sure to change the water at least once. The chickpeas will be double in size the next day. Wash them again. Add them to a large boiling pot. Cover them with water and bring to a boil. Cook them for 1 and 1/2 hours or until the chickpeas are really soft. Be sure not to add salt to the water or the chickpeas will turn out hard. Drain the chickpeas but reserve the cooking water. Put the prepared or canned chickpeas into a food processor, but reserve some for the garnish. Put the fresh tomatoes into a toaster oven an toast them until the skin is dark with blacken spots. You can also use ready made fire roasted canned tomatoes. Dice the tomatoes and add to the food processor. Add the garlic, tahini, olive oil, lime and cumin to food processor. Blend into a smooth paste. Add some of the reserve cooking water until you have the desired constancy. Some people prefer a thick dip and some prefer a softer one. Salt the dip according to taste. Place the hummus in a serving bowl. Add a dash of paprika. Place the reserved chickpeas as garnish. Server with vegetables, pita bread, or use as a sandwich spread. You can do a more traditional hummus omitting the tomatoes, garlic, and the cumin.